5 didžiausi mitai apie slaugą bei patarimai slaugantiesiems. It’s not easy being a caregiver. At times you might feel guilty, stressed or anxious. It will help to consider what’s behind these negative feelings. 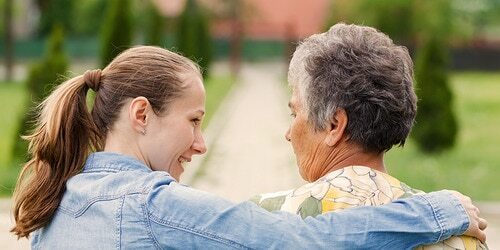 Often they’re caused by misunderstandings – myths about caregiving that become ingrained in the mind. When you understand the facts though, you can dispel those myths. Then you’ll approach caregiving in a better frame of mind. "I can do everything on my own"
You may think: my parents raised three children, so I can cope with taking care of one person. But caring for an older adult with chronic or serious illness is not as easy as raising children. Such caregiving can be frustrating, tiring, even overwhelming. It’s true that parenting is also hard, but at the same time you see a lot of progress and experience many moments of joy. In comparison, you might find caring for an elderly loved one who’s unwell a lot harder. Advice: Never do everything all on your own. Get help and support from others. Talk about it with your friends, family members, neighbors, other caregivers or professionals. Ask for help to make your caregiving easier. "Finding the right people to help me care for my loved one is easy"
Sometimes it can be easy. Family and friends offer to help you. You find good health professionals – people you like and trust – right when you need them. And you know they’re helping to give your loved one the best treatment and care possible. But it’s not always that simple. You might feel that the medical people, family or friends are not doing enough for him or her. Advice: If you’re unhappy with any of the professionals or other people involved in your caregiving, look around for others. You could ask friends or more experienced caregivers for their recommendations. Or search for highly rated health professionals online. In the end, it’s all about making sure that you and your loved one are comfortable, treatments are straightforward, and you’re both happy. "Everybody understands exactly how I feel and what I need"
It’s easy to think everyone around you can see that you’re working hard to care for your loved one. So you might think they know how to help you. But that would be a mistake. Others aren’t in your world; they don‘t see all the different aspects of your work and life with your loved one. Sometimes they just can’t understand or read the signals you’re sending. Advice: Tell others, in the simplest way, exactly how you feel and what you need. Be honest and clear in communicating your or your loved one’s needs. Don’t suffer because others have the wrong ideas about your situation. "My loved one’s health continues to decline, so I’m not a good caregiver"
You may think, if only I had more time to look after my dear one; if I didn’t get tired or angry; if I could get a better medicine – then their health would improve. But it may not be the case. Advice: Try not to be too hard on yourself. You’re doing your best as a caregiver. If you have good medical professionals treating your loved one, and her or his health gets worse, it’s not your or the doctors’ fault.The best thing you can do is just try to make sure the person you care for is as happy and comfortable as possible. "I have too many things going on in my life to be a caregiver now"
None of us is ever ready to be a caregiver. And when we do become one, usually we’re not able to give up our other responsibilities. We may need to keep working and raising our children. We’ll have to continue taking care of our homes. All while looking after an elderly loved one. That’s life. Advice: Try not to worry – with planning, you can fit caregiving responsibilities into your life Successful, experienced carers know that it’s best to organise their time. If you do that, you’ll be more able to handle your caregiving tasks, and balance them with your other responsibilities and interests. If you’re not sure where to start, click here for some tips and ideas on how to make a plan.